If you are looking for information on the The Crack Team franchise business opportunity, The Crack Team franchises or The Crack Team franchising, then you have come to the right place. According to the US Census Bureau, homeowners spend over $148 billion per year on home repairs and improvements. Since all foundations are inherently susceptible to cracking, cracks in foundations are one of the biggest problems facing homeowners today. 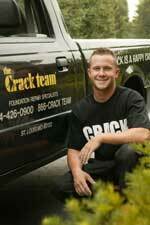 Since 1985, The Crack Team has been the leader in the foundation repair industry. We offer a once-in-a-lifetime opportunity to start your own successful business while utilizing our expertise, materials, support, and name-brand recognition. As a franchisor, The Crack Team wants to meet and exceed your expectations both personally and financially. Our business philosophy has always emphasized quality service at every step. We have developed a successful formula for operating a profitable business by providing you with the benefits and knowledge of over 20 years' experience. Our expertise will help you avoid costly mistakes typically associated with start-up businesses. The Crack Team's uniquely formulated Team Seal®, TeamFlex®, and TeamStop® materials are tested and time-proven solutions for cracked and leaking foundations. Our superior products and services ensure reliability and are backed by our "Happy Crack" guarantee. And because we do the repairs from the interior, our services are in constant demand year-round. The Crack Team offers support in all areas of development and growth. Prior to attending training, we will guide you through the development of your business with clearly defined objectives. Additionally, our comprehensive 2-week training program will incorporate all areas of running your business including sales, marketing, operations, and financial management. Once your business is up and running, we continue to promote your business through national ad campaigns and call-center services. We also provide on-going assistance with marketing and public relations, technical support, and business management. You will quickly realize the value of being associated with The Crack Team brand and how it directly impacts your business. Our name-brand recognition and effective print/display ads are priceless in generating leads from the general public. Our branding efforts have achieved national and international recognition and awareness. Consumers know they can depend upon The Crack Team for excellent value and superior results. You can rely upon The Crack Team to promote your business and to assist in generating customers. Our involvement with industry associations and referral networks allows franchisees to benefit from our contacts within nationally-recognized programs. of owning a successful business!